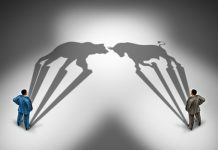 In this article I look at a 3 key charts on global equities that utilize market breadth techniques. In this case we are looking at the breadth across country benchmarks – i.e. 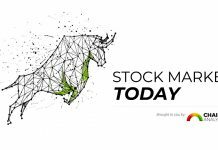 the main stock market benchmark of all countries where decent pricing data was available (70 countries in this case). 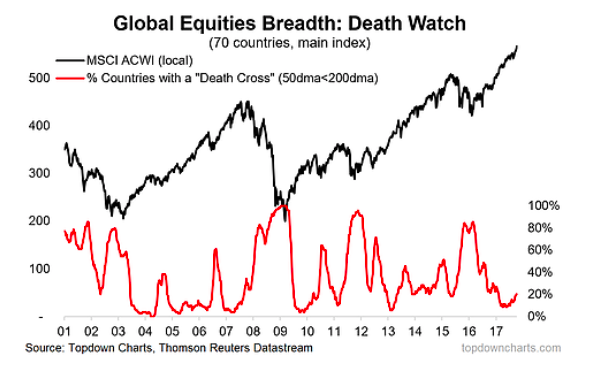 I talked about how we can use market breadth indicators to generate insights on the key trends in global equities in the article Global Equity Breadth Beyond Price, and here is another example of its application in real time. 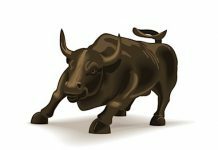 I am seeing bearish breadth divergence i.e. higher highs on the MSCI All Countries World Index (which is shown in local currency terms, to avoid the distortion impacts of exchange rate movements) vs lower highs on the 50-day moving average breadth indicator. 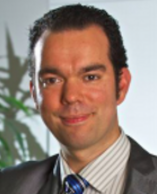 I am starting to see less countries with a “golden cross” – and hence, more countries with a “death cross” i.e. the 50-day moving average falling below the 200-day moving average. 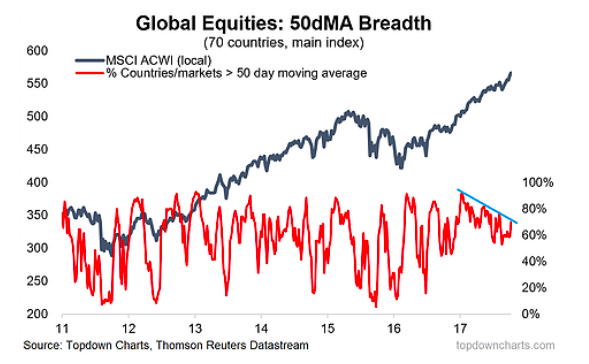 We’re seeing ongoing divergence in Global Equities country market breadth on a 50-day moving average basis (i.e. higher highs in the MSCI ACWI vs progressively lower highs in the breadth indicator). 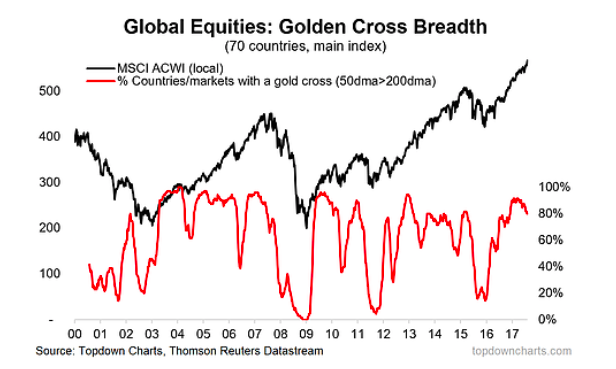 “Golden Cross Breadth” (i.e. proportion of countries with their 50dma above the 200dma) is rolling over, this can be an early warning sign.